A few weeks ago, I got to do a little styling session with Lululemon (more on that tomorrow!). As a thank you, we could pick out a top and bottom from the store… how cool is that?! Well, it got even cooler when the Assistant Manger told me about their latest arrival – a limited edition version of their Free To Be Sports Bra, called Free To Be Wild. As soon as I saw it, I was inspired to finally do a yoga post here on LSL, and I’m so lucky that we could use this beautiful city as the backdrop! I’ve been practicing yoga for a long time now. My mom introduced it to me back in high school, but I didn’t really take it seriously until I graduated from college. Since then, she became a yoga teacher, so we’ve definitely bonded over our love for the practice. This whole shoot was so much fun, but the shot below is definitely my favorite. A warrior over Chicago? Ali B nailed it. 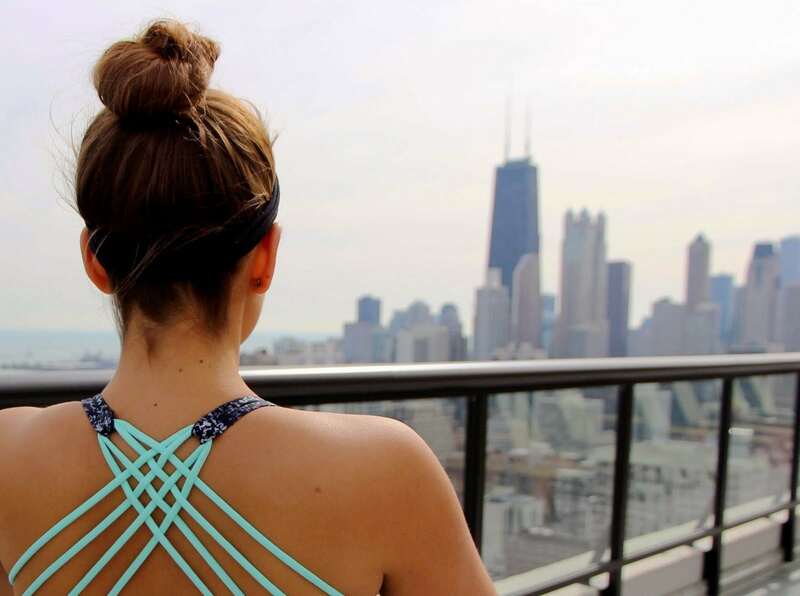 Ugh, is this not the most beautiful sports bra you’ve ever seen?! I seriously think my eyes turned into little hearts when I saw it. I’m also completely in love with these shine tights. The high waist means you never have to worry about them falling down during class, and the sheen is super modern – yes, there will be a normal everyday outfit post coming featuring these suckers. Taking the time to get centered, both mentally and physically, is important. It always makes me feel more like a confident, strong, capable woman when I practice regularly – and who doesn’t want to feel like that? Now, let’s talk about all my other gear! You obviously need a yoga mat and a gym bag. I carry the LeSportSac Medium Tote, because it’s super roomy and it has tons of zippers – great for gym locks, keys, and a water bottle. Speaking of water bottles, I love my BKR bottle. It’s lightweight and so pretty… plus, it comes in tons of colors, so you can pick your favorite! Do you guys practice yoga? What workouts do you enjoy? Favorite post to date! You look so awesome in all of these photos 🙂 I've been taking Bar Method for the past few months and I've really come to love it. My first yoga class ever was just a few months ago! You are the cutest and I just love this post! Seriously, the pics, clothes, scenery.. A+++! It was so great seeing you last week and I hope to see you again so soon! Dang Lulu has stepped up their yoga clothing game! This is a great workout outfit! And are you the cutest yogi! Great post girlfriend! This is so damn adorable! Those leggings just jumped to the top of my wish list! What a fun post and dang girl you are SO fit/in shape! Really giving me some motivation 🙂 Love the sports bra! Cute! 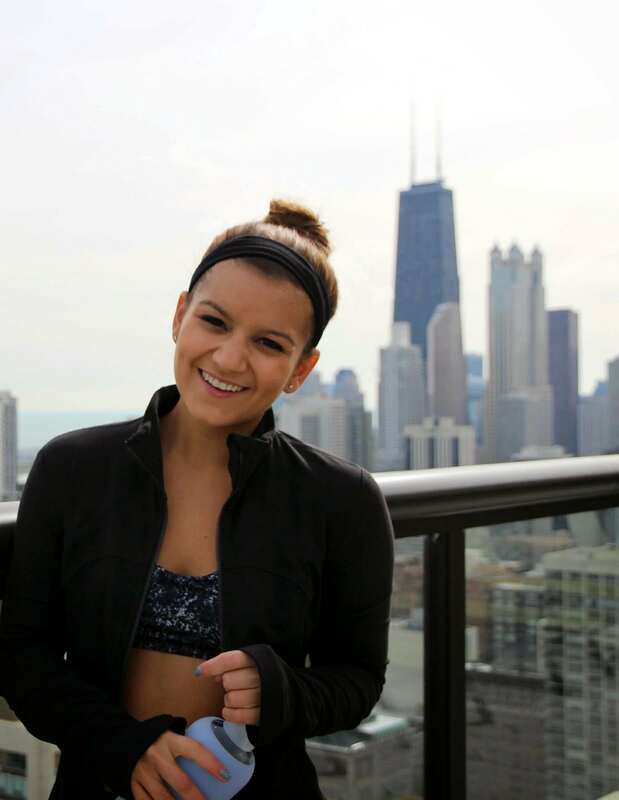 I love that you did yoga above Chicago! It's more fun than just in a studio, right? !